Vomiting is a common childhood occurrence, but some parents might see their child vomit more often than they would like. Vomiting can be managed effectively by giving a child appropriate fluids and watching for signs of severe illness. Because vomiting is a symptom rather than an illness, controlling vomiting means managing the underlying sickness or waiting for it to resolve. Vomiting occurs when the stomach contracts, forcing food and gastric juices back up the esophagus and out of the mouth. Vomiting can occur as a reaction to nausea or dizziness, although some children are unable to articulate these feelings. Many children vomit because the body is trying to rid the stomach of harmful products or bacteria. For children younger than 1, vomiting could be caused by reflux or a narrowed opening leading to the stomach. The most common cause of vomiting in children is gastroenteritis, or the stomach flu, according to PDR Health. Gastroenteritis is an inflammation of the stomach and intestines as a response to a viral or bacterial infection. Babies younger than a year who are vomiting due to gastroenteritis can be given a half-ounce of electrolyte solution every 20 minutes. If a baby is able to tolerate the electrolyte solution and has gone eight hours without vomiting, he can attempt to try formula, but do not overfeed. Infants who are breastfeeding should try nursing first for short periods every 20 minutes as tolerated instead of giving electrolyte solution. If a baby tolerates nursing without vomiting, increase the amount of time he can breastfeed until he resumes feeding at his regular intervals. Some children vomit if they eat food that contains too much bacteria. This is often referred to as food poisoning and occurs up to 12 hours after eating the spoiled food. Vomiting might last only a few hours and there is usually no fever present. 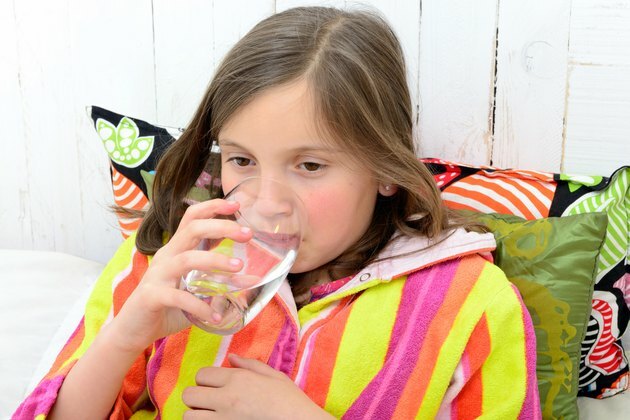 Children who vomit from food poisoning can be given clear liquids, as they are easy to digest. Examples of clear liquids include apple juice, ice chips or electrolyte solution. As a child continues to tolerate liquids, slowly increase her intake to include crackers, toast or rice. Some children might vomit because of an intestinal illness such as rotavirus. These types of illnesses differ from gastroenteritis in that there can be fever and abdominal pain associated with it. Children who have a fever and who are unable to keep fluids down can be given a rectal suppository of acetaminophen after permission from a doctor. This will provide comfort and manage the fever associated with the illness. Because vomiting can be resolved on its own and dehydration can be prevented with adequate fluids, many instances of vomiting do not require a doctor's notification. Other situations can be a sign of serious illness and should be reported. According to the Children's Hospital of Denver, parents should call a doctor if a baby has not had a wet diaper in six to eight hours; if a child has gone more than eight hours without urinating; or if a child has sunken eyes or rapid breathing, as these all can be signs of dehydration. Parents also should notify a physician if their baby has projectile vomiting, is throwing up bloody emesis, or is vomiting after a head injury.